Probably the most famous and famous wine-growing region California (Region North Coast ) and also the USA, The name Napa comes from the natives and probably means house. It is by far the largest part of the Napa County political district, but is often used as a synonym for it. It is mostly called Napa Valley, but does not mean Napa County that much. This is also helped by the fact that the AVA name Napa Valley may alternatively be used for wines throughout Napa County. 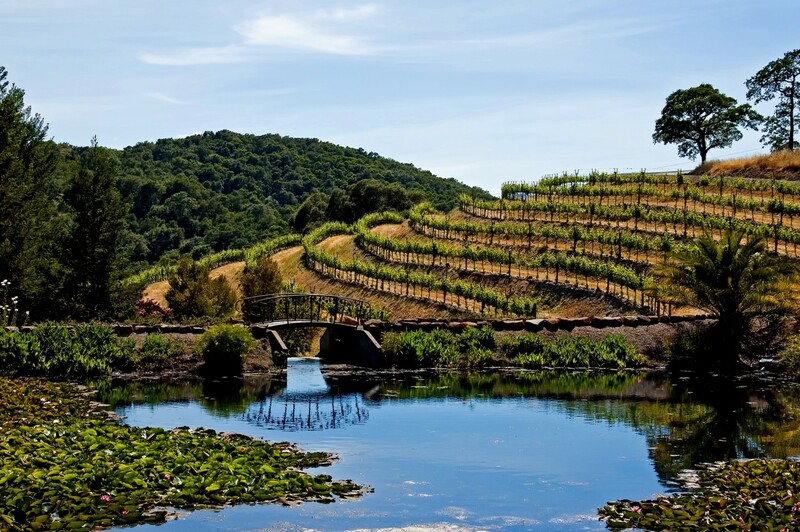 The other AVA areas of Napa County are the second largest area of ​​Los Carneros more or less only small enclaves within the large area with 18,000 hectares of vineyards. The 16 AVA areas are Atlas Peak, Chiles Valley, Diamond Mountain, Howell Mountain, Los Carneros, Mount Veeder, Napa Valley, Oak Knoll District, Oakville, Rutherford, St Helena, Spring Mountain District, Stags Leap District, Wild Horse Valley and Yountville. The vineyards are mostly in the valley, the surrounding mountain slopes were only from the late 1980s increasingly developed for viticulture and used. Incidentally, the area did not turn out to be more than a decade later than the one to the west Sonoma County planted with vines. It all started with George Yount, who planted a small vineyard in the Yountville area named after him. In the 1960s, especially from the Napa Valley went from the revolution and renewal of Californian or American viticulture. The Napa Valley stretches for about 50 kilometers from San Pablo Bay in the south to St. Helena Mountain in the north. To the west it is bounded by the Mayacamas Mountains and to the east by the Coast Range. The valley is crossed by Napa River. The eponymous city of Napa is located in the south of the county. At the entrance to the valley is a large sign with the self-confidently worded "Welcome to this world famous wine growing region" , and a quote from the Scottish writer Robert Louis Stevenson (1850-1894) "wine is bottled poetry" (wine is poetry in bottles). On the relatively short valley length are over 30 different soil types, In the south there is mainly fertile loam and clay, in the north, however, pebbly loam with less fertility. In the Napa Valley is the Terroir-thought most pronounced, which otherwise plays no major role in the Californian or American winemaking philosophy. The different climatic conditions are also reflected in the assignment to three of the five Californian climate regions. In the south this climate region I with the coolest area Los Carneros, in the middle of the valley the climate region II with Oakville and Yountville, and in the north the warmest area the climate region III with St. Helena. This page was last modified at 14 June 2018 at 11:39.